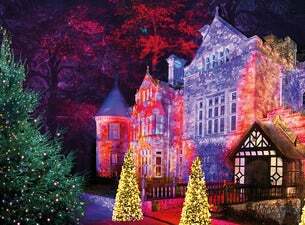 Christmas comes to Beaulieu for all to enjoy. The tree-tops will glisten as the gardens and buildings shimmer with seasonal sparkle. There’s something for everyone as a one mile illuminated path winds its way through the grounds in a magical after dark experience. Greeted by the sights and sounds of Christmas, wander beneath unique tree canopies drenched in seasonal colour. The Beaulieu festive trail is a place where fairy-tale meets fantasy. Explore the stunningly lit ruins of the medieval Abbey before pausing at the flickering flames of the scented Fire Garden Cloister for a moment of reflection. Perhaps leave a special Christmas Wish at the Wishing Tree before you continue through the Tunnel of Light festooned by a canopy of over 100,000 twinkling pea-lights. Surrounded by sparkling hedges, follow the path towards the Palace House Panorama. The grand country house, home to the Montagu family for centuries, is brought to life by beams of light that dance in time to much-loved Christmas classics. Amid all the fun don’t forget to glimpse Father Christmas and his elves as they greet you from the roof of Beaulieu’s veteran bus. Along the Icicle Walk, larger-than-life gleaming shards guide you towards the Meadow of Light where thousands of fibre optic lights sway in unison. There are hidden surprises too – watch out for frosty snowflakes, shimmering stars and gigantic baubles. As you wander beneath playful ribbons of colour-changing lights, the mesmerising voices of Singing Trees can be heard in the distance. Rising high into the night sky this festive finale is a cheerful Christmas blast of colour and light. Why not complete your stroll under the stars with spiced cider, mulled wine or hot chocolate whilst the aroma of roasting chestnuts fills the air. Gather to toast your own marshmallows at one of the fire pits, ride the vintage Carousel* or Ferris Wheel and enjoy other traditional fare before picking up a gift or two at Beaulieu’s shop.